Grenoble-based hardware and software synth creators Arturia have announced that the retail price of their flagship analog monosynth will rise from July 1st, 2018. Due to increasing cost of the internal analog components, manufacturing, and shipping, Arturia have made the decision to raise the price of the MatrixBrute, which was announced at NAMM 2016, and has gone on to win multiple media, consumer, and pro audio awards since its release.
" Arturia has always been keen on delivering instruments that offer high value for money. This is what we did with MatrixBrute, I believe, making a real statement that we could bring an outstanding synthesizer at reasonable price. " remarked Frédéric Brun, Arturia's founder and president.
" The decision to raise this price hasn't come easily, and we waited to make the change for as long as we could. Due to increasing component costs, and to aid our distributors and retailers in a context where several Euro/US$/£ have fluctuated since the introduction, we considered that now was the right time. " In the Eurozone, the retail price will change from 1999 € to 2299 € . In the USA, the price will change from 2199 US$ to 2499 US$ . Even with this price rise taken into consideration, it’s still one of the most exciting, experimental, and inspiring premium synthesizers on the market. Arturia’s global network of distributors and their retailers have been notified, and are ready to reflect the change in cost from this date. 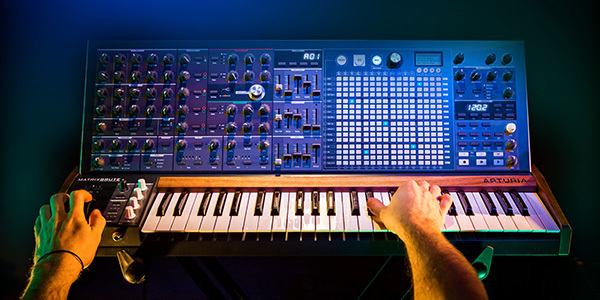 To find out more about the Arturia MatrixBrute, visit the Arturia website, or any good instrument store.